I recently stayed up late at a girlfriend’s house while visiting her town for a speech. We curled up on her oversized sofa with a glass of wine and laughed and reminisced and swapped harried working momma stories. Yet it is becoming more and more prevalent. All of us Gen-Xers learned as we moved up the career ladder to seize every opportunity to network with external clients or executives within our organization when given the chance (or find a way to seize the chance). Building those relationships during non-office hours are critical. Whether it’s volunteering with a non-profit, attending a gala for a key person’s favorite group, or attending a small group cocktail hour, there is no substitute for face time. What was hanging at the end of the sentence? Her and her partners concern the junior woman can’t be relied upon, can’t develop business, and can’t properly attend to their client network needs. She had already, early in her career, developed a reputation she wouldn’t put in the time to build out of office relationships. No amount of good work will translate into an ability to advance if we don’t recognize the need to develop relationships. I like to think, despite what my girlfriend suggests, that the ability to build and grow a network and supporters is timeless. 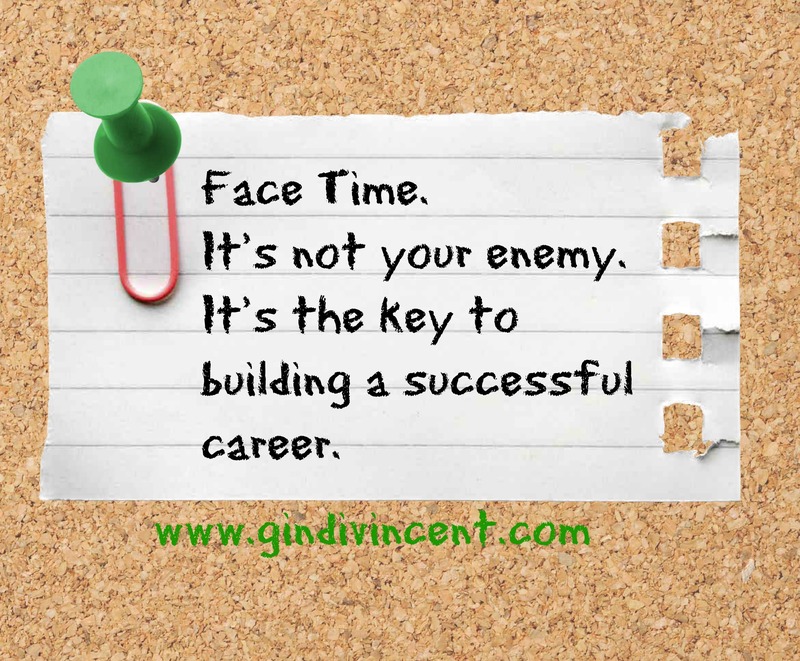 Even when the whole corporate world becomes virtual, there is no substitute for face time. Regardless of where you are in your career, your first job out of college or C-suite executive, putting in face time at events important to your colleagues, your employees, your bosses (and you always have a boss, even as CEO), your clients, and your supporters translates into strong relationships. You remain relevant when you engage in informal, non office, conversations. You become a trusted member of other’s circles. You meet new people through these events which grows your networks to even further advance your career as well as brings personal fulfillment in having an interesting and diverse set of professional relationships. Face Time. It’s not just for iPhones. It’s every woman’s career necessity.